Hello readers, and welcome to Null Byte. Before we start, for those of you who may not know me, my name is ghost_; I'm a relatively active member of our community and have been around for a while. During my time here, I've seen our community cultivate into the brilliant one we have today, people from all over the world with varying skillsets, excited to learn and help each other. Now, I know you're excited to start hacking and reenact the scenes from your favourite movies like Swordfish or The Italian Job, but first I think you should read through this to understand the appropriate way to post to Null Byte. First of all, you will notice the 5 links at the top of the page; I'm going to be walking you through those so that we have a solid understanding of the layout here. World Home: This is the entry point to Null Byte, it showcases the most recent activity here. You don't really post anything through this link, it's more of a starting point. How-To: Now some people have been getting confused with the function of the How-To section. This is where you post if you have written a step-by-step guide on hacking. Do not post things like, "How do I hack a WiFi hotspot? ", because it's not for your questions. Inspiration: This is where you post if you have something you want to share with the community that you find inspiring or interesting. Forum: This is where you post your questions or discussions. Creators: This is where you find a list of the contributors in the Null Byte community, you'll notice OccupyTheWeb, Bryan Crow, and Justin Meyers are always the top three. These three people are the administrators and moderators, everyone else is simply a user just like yourself. However, there are a few of us who have been around for a while and will gladly help you, such as CyberHitchHiker, Ciuffy, Cracker Hacker, Phoenix750 and of course, myself. With that being said, we are not the only contributors around, there are a lot more who will gladly help you with questions. I know it may seem a little bit nitpicky, but organisation is very important so that people can easily navigate around the site. Please stick to this. Speaking of navigation, there is a search function at the top. If you have a question like "How do I hack a WiFi hotspot?" do a quick search here first, there's most likely already a guide available. Simply type something like "wifi hack" and you'll get all relevant results in Null Byte, neat huh? Now, before you start posting like crazy, there is a bit of etiquette I feel we should cover. 1. Please use the best spelling, grammar, and punctuation you know. If English is not your native language, that's okay, I said earlier that we're from all over the world. But if you have a firm grasp of the English language, please post legibly. It not only makes our lives much easier, but it simply looks better. None of this, "how do u do dis lol", or "y does dis hapen?" as it looks awful and simply degrades the quality of Null Byte. This goes the same for swearing, please refrain from doing so, it's not constructive. 2. Please address one another with respect, we're not your dude, man, or bro. But particularly do not speak to OTW in that manner, he's your teacher, address him as such. 3. Do a bit of digging before you post a question. Don't give up at the first obstacle, do a bit of your own problem solving, it's very important that you develop this skill as it's paramount to hacking. Look around the site, look in the comments sections, look offsite. With that said, I'm not discouraging you to ask for help, please do. Just do a bit of your own research before you do, you may even find the answer yourself and that feels awesome. 4. Please be patient. I can understand that you're eager to hack and you may have posted your question hours ago, but we all have our own lives to live. Your question will be answered, it may just take some time. 5. Do not verbally attack, degrade, or bully one another. We're all here for the same reason and no-one should have to put up with that. If you have a differing opinion to someone else, keep it to yourself or bring it up in a constructive and civil manner. If you've noticed that what someone has posted is wrong, please let them know in a constructive and civil manner. Get the pattern here? Fantastic, let's keep going. 6. Plagiarism is not tolerated at all. If you find something worth sharing with the community, please share it, but provide a link back to the original source and paraphrase the parts you find interesting. Cracker Hacker recently created a post about this very subject, and trust me, we can and will find out very quickly if you plagiarise. 7. If you are an already experienced hacker wanting to learn more techniques, first I say welcome. You may have noticed that we are a very welcoming community and we would like to keep it that way. If you decide to begin to help newbies; then please do so with the respect you have received. We do not tolerate malicious behaviour in any way, if you feel that the new user does not have enough knowledge to begin hacking, please direct them to this post here. Do not do something such as tell a newbie to run a command that will delete their OS, that kind of action will result in this. 8. Please be specific with your questions. We can't help you if you give us no information to work on. Tell us what you want to do. What your end goal is. As much information as you can possibly give us, it leaves less guesswork for us, and more accurate information for you. It can be a bit daunting at first, but there are posts to help you out. I'm going to consolidate those posts here as a starting reference for new users. Firstly, a solid, foundational understanding on computers is absolutely necessary to begin hacking. Learning the basics is important because you will always be using that knowledge, hence why it's foundational knowledge. If we look at it in terms of building a house, if you don't have a solid foundation, the rest of the building is unstable and likely to collapse. Simple, right? Therefore, you must have a good understanding of computers before you start here. It's incredibly important. The Legal Consequences of Hacking, this is a very important post. I urge you all to read this and know that there are very real consequences to what we can do and what is taught here, so please be cautious. 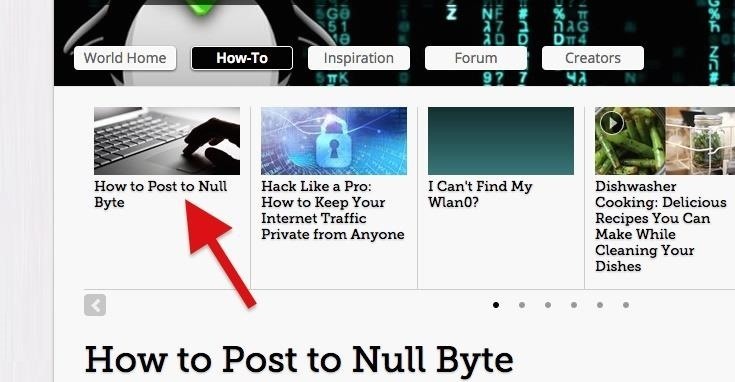 How to Use Null Byte to Study to Become a Professional Hacker, this is a post made by OTW and it shows you his layout for the tutorials. Linux Basics for the Aspiring Hacker, Linux is the hackers OS of choice. Learn it, use it, master it. Almost all the tools available for hacking are built for Linux. Kali Linux Portability, this is a great guide made by another member Ciuffy. It's all about getting portable with Kali so that you can use it with any machine you have available. It's also pretty much become the Kali installation guide, so there's a lot of information here on Kali installations, not just in the guide itself, but in the comments section. How to Create a Virtual Hacking Lab, a big part of hacking is the practical application of it. Your knowledge is pretty useless if you can't apply it; however, hacking is illegal and can carry heavy penalties. This is where virtual labs come into play, you can create pretty much any scenario you need and then hack away. The Hacker Methodology, this goes through the steps you will need to carry out in order to perform a successful hack. Each step is significantly important, so read up and learn these backwards. Essential Skills to Becoming a Master Hacker, if you're like me and you want to make hacking into your career, you will be very interested in what exactly you'll need to know in order to be able to carry out your job. And let me tell you right now, it's a lot. But don't let that deter you, it's a lot of fun learning about all of these things. Null Byte is, first and foremost, an educational community. Meaning we are here to learn, not commit crimes. We are not your personal tech support team and we are not for hire. Please do not make posts or send us emails asking us to perform a hack for you. Finally, if you make a post wanting to know how to do something simple like cracking the password for an AP, or hacking your school's network, with no intention of actually learning anything, you are a script kiddie. I, personally, don't help script kiddies and I don't think anyone else should either. Not only is it a waste of our time, but it's probably for the best that you don't know how to do whatever it is that you want to do either. If you are an existing member, please feel free to link this to new users you feel could benefit. Added number 6, plagiarism in the Null Byte Etiquette section. Added malicious behaviour to number 7 in the Null Byte Etiquette section. Added swearing to number 1 in the Null Byte Etiquette section. Added number 8, information when asking questions in the Null Byte Etiquette section. Added Phoenix750 to the Null Byte Layout section. Great tutorial for us beginners! I just got tired of seeing the same things being posted over and over again. I figured that this would help, not only with new users becoming a part of our fantastic community, but also so that I wouldn't come off as being so grouchy or mean. Well thanks for the great tut! Thank you, I will be updating this with any other posts suitable for newer users. If you have any suggestions, please do so. As I said earlier, great tutorial, sir. One suggestion for those newer members of the community would be to make a tutorial like "What Not To Post". This would be helpful for people who make forums of requests to hack websites as we have both seen earlier with that gentlemen who wanted to hack his university but didn't know how to ping it. Once again, excellent intro to the Null Byte community, ghost. I did subtly touch on that throughout the post, though, I may expand on that and give it it's own section. However, with that being said, new users aren't going to read this until they make that mistake and this is linked to them. So it will be a little null and void. just wanted to reply on your saying their i hope i don't make a mistake here. But i really like this site already, i lack on the English part but will do my best. and was given a link to here don't wanna make credits but your a are mistaken on the part that no body read this before posting some thing i see this as a post and i read the completed thing before this comment and until this post. also i read little bit further but just a little. beside that said i hope you can link me just some interested posts on this site and i can become a etical hacker my dream job what i never had the concentration for. i hope i do now and wish you all good luck with this community and maybe some day i will be a poster to here helping some one out like me. Im relatively new to null-byte, in the sense that i just now created a profile, but i came across this linked to someone elses post while browsing for an answer of my own, and i just want to say that this, this is awesome, and you should absolutely add a clear section on the what not to post part for new people, all the how do i do this in the wrong areas, or even in general actually make it harder for someone to find what theyre looking for because now they have to sift through extra. Regardless, this link in itself is why i created a profile. So thank you. The problem there is that the people that the post applies to most are likely the same people that would skip over it anyway and say something like "Hax my frnds fcebook plzzz"
I'm aware of that, however, it's something we can link to them and move on. I just made a post about plagiarism as this has happened a few times recently. I suggest you add it to the list. I feel it's something some of us struggle with. Added to the original post, thank you for your efforts, Cracker. Thanks. Atleast this been done. I could direct a few visitors to this post. Thanks once again for your time Sir !! 72 notifications @ WonderHowTo in 4 hours... #Absurd"
What! Are there so many people here? I gotta say, Null Byte is making huge steps and becoming larger and larger. We should be proud of if. I was more annoyed at the amount of "how do i hack this pls" posts. That's why I wrote this. But yeah, I'm quite proud to see how far Null Byte has come. A lot of times in code, you'll need to use an underscore. On this site, an underscore is formatting tool to make italics. So, if you have something that is supposed to look_like_this, it will end up lookinglikethis. To make an underscore on Null Byte, or anywhere else on WonderHowTo, you use a double-underscore, i.e., __ = _. Same goes for asterisks. They are formatting tools for bolding things, so if you need to write an asterisk, double it. ** = *. I see a lot of code snippets missing underscores and asterisks because they don't know these things. Occasionally I'll go in and fix them, but sometimes it's hard to tell what to fix because if you have one underscore, it will also automatically add another underscore at the end of the block. Hyperlinks are also good, and can be added by simply highlighting the text you want to hyperlink, clicking the chain link icon in the formatting tools palette, and pasting the link in. For comments, or if you just want to do it manually, it'd [websiteurl look like this] formatting wise, and this as a hyperlink. And to create a normal bracket, again, double it: [[ = [. Other than these little formatting secrets, I thing ghost_ has everything pretty much covered above. And we finally got to the "this must always be on first page" article, thanks for the time spent on this, hope it was worth it. I agree with everything you said, especially with the 3rd point in NullByte Etiquette. Finally, I recommend to not help criminals-wannabe and script kiddies too. It's called "security awareness playground" for a reason. Script kiddies should be pointed to programming learning. Seriously, is there a way to show this in the home page? Was well worth it, and I totally agree on all the points you made. I made it a "sticky" (i.e., first article shown) in the featured carousel at the top of every Null Byte article page. Hopefully it'll stick out. Where is it? I can't see it. Can't make it a true sticky right now, but it'll always be first. I guess this is enough for now, thanks Justin. I honestly think this should be even more visible, but maybe this is not so important, feel free to do anything you think is needed. Will do, I'm excited for the update. Thanks, will it be a permanent sticky? Yes. I set it for forever, so it'll always be up in the carousel. It definitely does stick out because that's how I found this post. Good to know my efforts haven't gone to waste. agreed, I have run into many threads containing users asking how to hack a website. Thanks for the positive feedback, guys. This honestly was more of a post fuelled out of irritation but it's something I've been meaning to do for a while. Now we finally have a universal post to direct new users to and hopefully will get this place a bit more under control. Any suggestions to improve the post will be appreciated; I want to make this as user-friendly as possible. Maybe you should add a link to the wonderhowto rules page. This would tell new users about reposts, quoting, and other important information. Very well said ghost_, very well said! Great post! I can't tell you how amazing this was! It would be nice, though, if people were more specific in their titles rather than just "Kali Linux Problem," that way it can be searched for easier if someone has the same problem. If only. Thank you for the compliment. I'm noticing that I have to give questions for people to ask such as "what computer are you using? ", "have you tried re-imaging it? ", "does something strange happen in the installation? ", and "is there an error message?" If you could add these questions somewhere in here as guidelines, hopefully that will make questions easier to answer. Will do that in approximately 6 hours. Seems Like I"m always dragging up in the rear. It's been my life story. Ghost Very well laid out . That's how these tutorials are supposed to be. Thank you for your efforts in educating us noobs. I've 20 years in different industry but this is where my passion is and people like yourself and many others make it more encouraging. When you get around to answering thee questions I have one...while conducting port scans, and I understand recon is the forefront of your hidden identity, but other than -D while running Nmap and Arp spoofs is there for camouflage? Sorry, I missed the notification from your post. I'm glad I, and the many others, inspire you; hope to see you learn some things. As for hiding your identity, there are many things. Spoofing, proxychains, botnets, et cetera. However, recon isn't about hiding your identity, it's about knowledge. It's about knowing precisely what kind of plan you need, in order to carry out a successful hack. It's about knowing your enemy. That's why we harp on about recon, because it's a significant part of the hacking process and something that can make or break a hack. great one and you explained very clearly. Since the new IRC channel has just been releases maybe you could make an update to the article just briefly talking about? Just thought its a good place for beginners to talk to fellow Nullbytiens. Do you know what the best ethical hacking camp for a 12 year old is?